The pace of business change in the digital era requires faster access to information to drive proactive responses. SAP HANA, powered by in-memory technology, enables real-time access to the freshest information, in support of digital transformation. 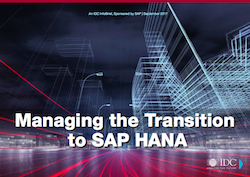 To set your business up for success make sure to download and read our white paper Managing the Transition to SAP HANA.